Why the Historic Environment needs a Spatial Data Infrastructure. McKeague, Corns and Posluschny. Internet Archaeol. 43. Spatial data should be at the heart of decision-making processes relating to the stewardship of the historic environment. To do so, the data need to be collected systematically to a consistent standard and shared to support a range of decision-making activities, from what to protect through mitigation of planning applications to where to excavate. Encouraged by Open Data initiatives and through the INSPIRE Directive (European Commission 2007), there is a greater expectation for remote and open access to data, including spatial data, to enable others to work more efficiently. Spatial data also help foster interest in the historic environment and encourage public interest in the past. Good data governance is at the heart of delivering spatial data to meet these requirements. 2. What is Spatial Data? When people think of spatial data they tend to think of the location of an object or place represented by a point on a map. For many activities a coordinate, dot or a marker on a map is sufficient. It is useful for navigation – marking the location of a chosen destination or nearby points of interest. Point data is also useful for generalised distribution maps showing the locations of sites or find spots, but at larger scales the limitations are quickly exposed. Documenting the full extent of historic sites presents a much richer and more meaningful resource than the simple distribution map (Figure 1). As well as location, spatial data should represent the size and shape of a set of features linked to a series of attributes that describe the mapped objects. Attribution might include the name, classification, age, size and legal status of mapped features with hyperlinks to additional online resources, including digital copies of legal documents. The symbology used to visualise features may be determined by values stored in the associated attribute table and it is possible to present the spatial data thematically through different symbologies or style-sheets. Heritage professionals routinely create or use spatial data on a daily basis through a range of activities, from desk-based assessments, remote sensing techniques and field survey to excavation. Objects in museum collections and the results of scientific analysis also have an inherent spatial relationship derived from their original find location. Brought together, results from diverse data sources and projects combine to form the evidence base to support the decision-making processes across a range of sectors and actors. Data informs heritage management activities, including formally protecting archaeological sites and buildings, and is essential in the analysis and characterisation of historic landscapes. Access to data is also essential in considering planning applications, asset management, for both academic and personal research and increasingly for public engagement. However, coordination of spatial data for the historic environment is lacking. Approaches are fragmented across national and regional boundaries, between national and local agencies, the public, private sector and academia. Standards in data collection vary across organisations and even on a project by project basis. Accordingly, there tends to be no consistent approach to capturing, storing, sharing and presenting spatial data about the historic environment. The value of data, captured at some expense, is not being realised. Data from fieldwork are not always accessible. Data may be retained by the creator, lost or, if deposited in an archive, may not be stored in an easily reusable form, accessible only as an illustration in a publication orphaned from other datasets. Intellectual Property Rights, copyright and restrictive data retention policies also inhibit reuse. Historic environment data collection follows a multiplicity of standards in terms of projection, accuracy, content and format. Existing methodologies may be convenient for individual projects and organisations but the fragmented and inconsistent approaches to collating and sharing spatial data devalue and limit the potential of these resources. Approaches to presenting spatial data are project driven, and thinking framed by traditional publications rather than seizing the opportunities digital technologies present in enabling data reuse. Data should not be constrained and straight-jacketed within project reports but liberated and placed within the wider landscape of a digital map. In persisting with established working practices, opportunities to engage within the profession and with other professions are being lost. The profession is slow to wake up to and adapt to the impact of new technologies and methods of working. Web services now provide remote access to a wealth of data from many public bodies. 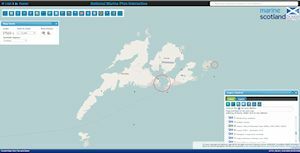 Publication of spatial datasets as view (Web Map Services – WMS) and download services (Web Feature Services – WFS) enables spatial data held by one organisation to be accessed remotely, combined and used with other datasets outside the host body. To share data through view and download services efficiently requires something that is currently lacking across many historic environment datasets – agreed data standards. Through the European Commission INSPIRE Directive (European Commission 2007), transposed into national legislation of member states in 2009 (cf. Scottish Government 2009), all European Union countries are required to share environmentally related datasets so that they can be easily accessed by other public organisations within their own and neighbouring countries for the purposes of Community environmental policies and policies or activities that may have an impact on the environment. There is thus an increasing expectation that publicly held data should be available, without undue restriction, to inform decision making about the environment. If the data are not discoverable and accessible they cannot be easily considered alongside other relevant datasets and help positively influence decision-making processes until far too late. Key to delivering INSPIRE is the establishment of Spatial Data Infrastructures (SDIs). An SDI provides the framework for coordinating the policies, infrastructure and standards needed to acquire, process, distribute, use, maintain and preserve spatial data to deliver GI enabled business applications and services for social, economic and environmental benefits. Although INSPIRE mandates a national approach, SDIs may also be established regionally or thematically. Examples of thematic SDIs include One Geology, which aims to provide access to geosciences data globally, and various marine initiatives (Rüh 2014), including the Marine Environment Data and Information Network (MEDIN) in the United Kingdom. For each dataset, INSPIRE requires metadata for the creation and maintenance of searchable catalogues to identify what data are available, who is the holder and any access constraints. INSPIRE also requires data publishers to set up network services providing View services (WMS), Transformation services, Data harmonisation through consistent schema and Download services (WFS and ATOM feed). It also outlines charging for public access to services and includes monitoring and reporting on INSPIRE compliance. INSPIRE defines 34 themes (Figure 2) organised into three annexes and, more recently, grouped into a series of thematic clusters. There is an expectation that datasets will be published to the agreed technical specifications by 2020, with a shorter timetable for the Annex I and II datasets. Unsurprisingly, given the drivers behind INSPIRE, there is a strong emphasis on the natural environment although several of the themes are potentially relevant to data collected about the historic environment. For instance, there is a relationship between the legal designations and non-statutory monument records about historic buildings and data in the Buildings theme. Landscape and land-use characterisation projects fall within the INSPIRE Land use theme, while archaeological collection of ortho-imagery and elevation data, typically from airborne laser scanning, could be covered if such data were held by a public body. The only theme that specifically covers historic environment data is the Protected Sites theme. The Protected Sites theme covers a range of historic environment data including: the World Heritage Convention (1975), the national laws of each European country, EU and international sector policies and National Monument Records. Protected Sites may also be managed through other effective means, including planning guidance. Protected Sites may differ greatly in their reasons for protection, their designation and their management. They may not be formally protected but managed through other effective means, including planning guidance such as the Planning Advice Note (PAN) 2/2011: Planning and Archaeology for Scotland (Scottish Government 2011) or the Communities and Local Government 2012 National Planning Policy Framework (PDF) for England. There is thus some ambiguity in interpretation of the definition of what is a Protected Site, with a narrow interpretation favouring only those datasets that are formally protected rather than the wider resource. If the purpose of INSPIRE is to enable access to relevant datasets to inform policies and activities that affect the wider environment and ecosystems, this approach undervalues the wider historic environment, which is arguably more at risk than the formally protected sites, in those decision-making processes and begs the question of where undesignated heritage sits within INSPIRE. Individual data custodians across Europe publish selected data through their own web-GIS portal. Both Sweden and Norway maintain web-GIS portals while examples from Poland (Oniszczuk and Makowska) and Albania were presented at the symposium. Across the British Isles the national agencies and many of the local authority Historic Environment Records (HERs) developed their own web-GIS portals where the user is able to use a limited range of functionality to pan, zoom, query, select and even download specific data (Table 1). The national agencies in both Northern Ireland and the Republic of Ireland maintain their own map-based portals. 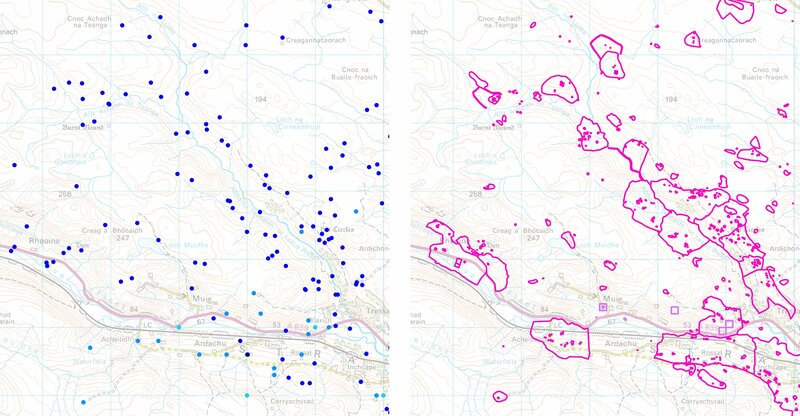 Scotland and Wales share a common infrastructure to publish web-GIS for the National Record of the Historic Environment (Canmore), maintained by Historic Environment Scotland and Coflein, or the Royal Commission on the Ancient and Historical Monuments of Wales. They also host portals combining statutory datasets with data from local authority HERs (PastMap (Scotland) and Historic Wales). 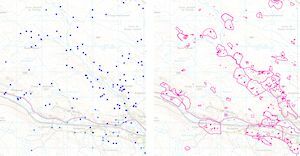 The national Historic Land-use Assessment data from Scotland are also available through its own portal and may also be downloaded under licence. In England, the Heritage Gateway takes a different approach, favouring searching by queries over a web-GIS interface. Although providing access to data, the data remains siloed in institutional portals with no common spatial index across resources. The web addresses presented in Table 1 were last accessed 9 February 2017 but lack the assurance of persistent URLs to ensure the continuity of references to online resources in face of business or technical change. If the argument that the datasets published through the various national portals are covered by the Protected Sites theme, then there should be relevant metadata WMS and WFS records available online. 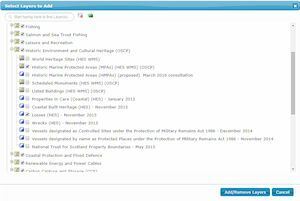 For Scotland, metadata, view and download records are created and published locally through the Scottish Spatial Data Infrastructure Metadata catalogue. Data are then harvested to the United Kingdom Data portal, and for maritime datasets copied to the Marine Environment Data and Information Network (MEDIN) portal. The records are in turn harvested by the INSPIRE Geoportal, where users are able to search for datasets, layers and services across Europe. The portal searches across thousands of records from the 34 INSPIRE themes but is designed for technical users rather than the interested public. Results are only as good as the indexing of the datasets and therefore depend on the consistent application from controlled vocabularies to describe datasets published by the data custodians. Existing data discovery portals could be complemented by a registry of available spatial resources for historic environment data. The registry would be designed with the non-specialist user in mind to provide links to the relevant national and regional web-GIS browsers, as well as any public-facing view and download services. Rather than developing a new solution, the registry could build upon existing European Infrastructure projects such as CARARE and EUROPEANA, or the recently launched ARIADNE Portal). Within the ARIADNE portal much effort has gone into the harmonisation of heritage classifications such as monument types and chronological periods to ensure the semantic harmonisation of cultural heritage data across the European region (Aloia et al., 2017). The ARIADNE Portal already includes dedicated pages for Landscape Services and could be developed to signpost national portals and appropriate discovery metadata, View and Download services provided by the relevant data custodians. Spatial data is more than simply the mapped footprint or site extent of each asset but it also includes a range of tabulated attributes. For the Protected Sites data specification, INSPIRE defines a simple or core application schema, containing a very limited set of fundamental attributes, including geometry, identifier, namespace, name and legal foundation date and document reference. Within the extended schema (INSPIRE 2009, 20) the following data types published through the INSPIRE registry (INSPIRE) are relevant to heritage designations: World Heritage Designations and National Monuments Records. The latter defines 18 broad categories – Domestic, Defence, Religious Ritual and Funerary etc. – that reflect the broad categories for monument classification in use in Britain, published as Linked Data on the Heritagedata website. The Heritagedata.org approach defines the concept rather than the term, enabling greater flexibility, including handling terms expressed in multiple languages to labels, an approach addressed more fully in research package 15 of the Ariadne project (Tudhope and Binding 2016). INSPIRE identifies a limited set of attributes (and values) for Protected Sites data suitable for the general use of published data by non-specialists. In considering how cultural heritage data could be incorporated within INSPIRE in Spain, Fernández Freire et al. 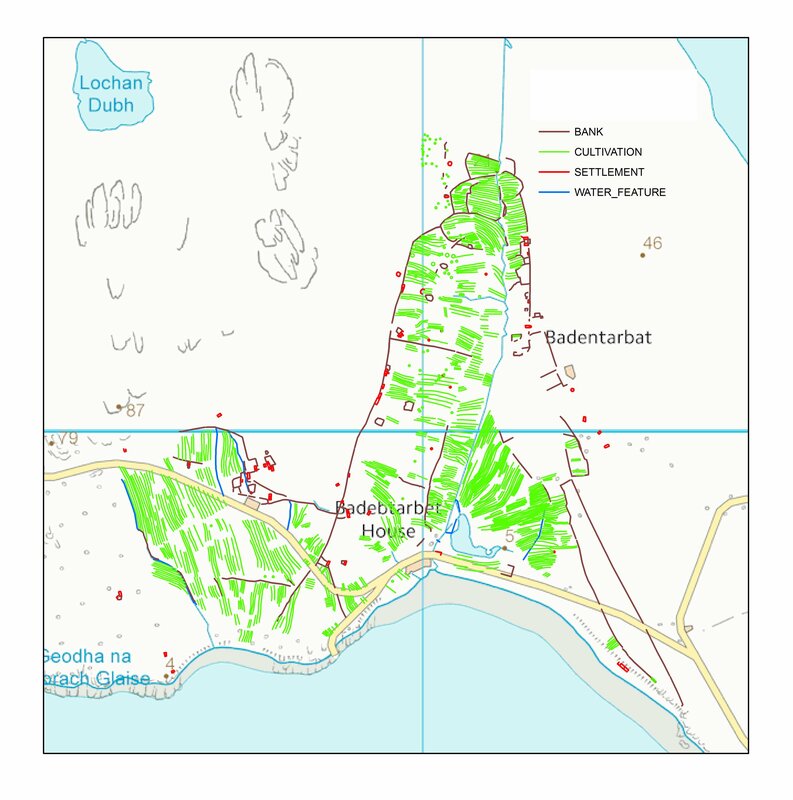 (2014, 16) observed that although heritage data were covered by the Protected Sites theme, the technical specifications were modelled on the natural environment requirements. As a result of their research, they proposed a much richer data model for cultural heritage within INSPIRE. They recognise the opportunity INSPIRE presents to develop a thematic SDI in an interoperable framework and their data model has been tested by several agencies across Spain (Fernández Freire et al. 2014, 37). INSPIRE specifies a range of datasets that must be published as Metadata, View (WMS) and Download (WFS and ATOM feeds) services by 2020. These datasets are accessible to a wide range of users and view and download services may be reused by third parties subject to the relevant licensing. 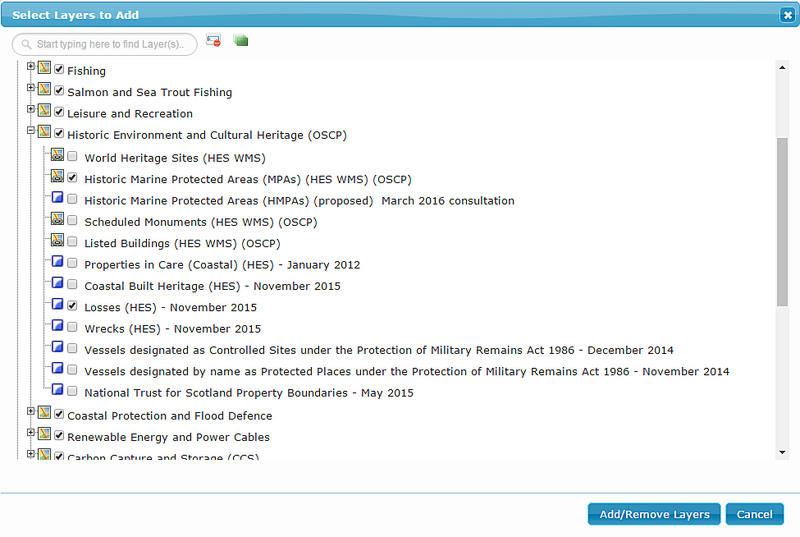 In Scotland, the spatial datasets published through Canmore and PastMap, dedicated heritage portals maintained by Historic Environment Scotland, are also shared externally with other agencies as downloads sent direct to third parties or, for designation datasets, from the Historic Environment Scotland Portal. Data are also provided through WMS and WFS to external portals. For instance SEWeb, hosted by the Scottish Environmental Protection Agency, provides a trusted gateway to over 200 map layers from 13 partner organisations giving a range of datasets about Scotland's Environment, including its heritage. Heritage data are also shared and published with Marine Scotland through their National Marine Planning Interactive portal using a combination of live WMS for the designated datasets, including Scheduled Monuments, Listed Buildings and Historic Marine Protected Areas, or updated periodically from shape files for the Canmore data provided to the site administrator for manual upload (Figure 3). With websites consuming services remotely, currency and quality of information provided through live links is essential to ensure good decision making from the best available evidence. With the publication of metadata and web service records through online registries or catalogues such as the data.gov.uk website in the UK or the INSPIRE geoportal, it is now possible to discover and access a range of web services. WMS and WFS may be consumed directly into remote GIS applications, viewed and analysed alongside third-party data to support decision making by a range of professions, including environmental consultants, planners as well as archaeologists. Again, to improve information discoverability there is a need for a dedicated registry collating these web services to complement the indexes to national and regional web-GIS portals. As software develops, more and more complex modelling and interrogation using semi-automated and automated procedures of data provided as WMS or WFS will become routine. For instance sophisticated software already models the dynamics between the living and their surroundings to deliver positive change to the management of eco-systems. These techniques herald 'much more interactive approaches to decision making through professional and public participation. For instance Quickscan, packaged as a Decision Support Tool (Verweij et al. 2012), provides modelling software and takes a participatory approach to visualise quantitative and value-based modelling in decision processes. The approach questions how we value the information in inventories. The values of the specialist may be too complex for broad-brush modelling and may differ from those the local community place on their heritage. Local landmarks and local associations – the intangible cultural heritage associated with a place – may add value beyond that ascribed by the specialist. The specialist may want to know that a site is a burnt mound or a cursus monument but for stewardship of the land a local farmer will need to know if the site is upstanding, a cropmark or destroyed' (McKeague and Thomas 2016, 123). Using historic environment data alongside other datasets in broad-brush modelling tools such as Quickscan highlights the need to consider potential reuse of published data. For heritage datasets the focus is generally on the legal status and classification but broad-brush modelling tools may require us to think in terms of presenting data in terms of 'High-Medium-Low' significance or 'Red Amber-Green' risk to facilitate complex scenario modelling. It is fundamental to both the success of modelling change in eco-systems and the consideration of the cultural heritage and historic environment in those processes that the software can access a range of web services, thus providing reliable, consistent, current and meaningful data. Smarter working through the online delivery of public services to enable the growth of the digital economy for the benefit of the citizen is at the forefront of modernisation and growing the economy in many countries. Both INSPIRE and the G8 Open Data Charter recognise the value of breaking data out from institutional data silos to contribute to the knowledge economy. 'Access to data enables individuals and organisations to develop new insights and innovations that can improve the lives of others and help improve the flow of information within and between countries' (Cabinet Office 2013). In particular the G8 Charter and its subsequent transposition into national legislation (cf. Scottish Government 2015) raises the expectation that all government data will be published openly by default. For instance, the Scottish Government's Open Data Strategy (2015 [PDF]) recognises that "Open access to non-personal and non-commercially sensitive data from public services is recognised as a resource for wider societal use and as such is made open in an intelligent manner and available for re-use by others. Making data open will support: delivery of improved public services through public bodies making use of the data, wider social and economic benefits through innovative use of the data and accountability and transparency of delivery of our public services". The expectation is clear – publicly maintained datasets will be made available. For data curators familiar with established practices of providing specialist knowledge and advice, remote access, Open Data and data-driven decision making raise a number of concerns. First and foremost is the threat to heritage from unlawful activities, including metal detecting and theft, and local circumstances will inevitably tailor approaches to mitigating that risk. However, sharing data coupled with 'formal and informal education about the historic environment enables people of all ages to understand, enjoy and appreciate it, incentivising them to care for it and take an active role in its monitoring, preservation and management' (Scottish Government 2014, 24). Secondly, the dialogue between the archaeological curators and prospective developers is an essential component in the stewardship of the historic environment. Curatorial advice at an early stage of planning applications can encourage more sympathetic consideration of the heritage in a prospective development. A data request can be enough to trigger a dialogue but accessing data remotely removes that opportunity until the planning application is formally submitted, by which point it is much harder to influence the proposal. Yet remote access to data should be seen as an opportunity to ensure that the historic environment is visible and considered at an early stage in any development or in the stewardship of the land, and that appropriate advice is sought in interpreting the data. Access to the relevant historic environment data should also provide benefits in the form of improved efficiency in the planning and development process, with a range of professions able to rapidly identify and reuse those spatial datasets applicable to their business. With remote access and machine-driven decision making, accurate representation of the extent of the known (and potential) heritage becomes critical in informing decision-making processes. In Scotland, area features – or polygons – are created for a number of purposes. For Scheduled Monuments and Conservation Areas polygons indicate the legally defined area. Polygons may also define areas investigated through fieldwork or the known site extent based on the available evidence, but they may also define areas of potential either created independently or buffered from the existing knowledge (Middleton 2010). It is therefore important to understand exactly what remotely accessed layers represent. Both human and machine users of the data need to understand the distinction between the made, or fiat, boundary and the real world, or bona fide object of any protected site (Fernández Freire et al. 2014, 18) as the legal entity may not coincide with the full extent of the monument, parts of which may not be formally protected. Legislative approaches are not homogeneous across Europe. Across the British Isles there is a selective process in formally protecting monuments but other jurisdictions adopt different approaches. In Scandinavia the age of the monument determines the nature of the legal protection. For instance, all archaeological and architectural monuments and sites pre-dating 1537 as well as buildings pre-dating 1649 are formally protected in Norway (Lov om kulturminner 1978). Understanding the context of the data through the discovery metadata is essential. More critically, there is also a need to recognise that many of our datasets are not complete. Most geographic datasets published as view and download services represent a binary view of the world. The data are either part of the dataset or not. For heritage data, the legal boundaries defining protected sites, such as scheduled monuments across the British Isles, fall into this category. Yet much of the historic environment is not formally protected. For instance, in Scotland 93% of the known archaeology is not formally protected (Historic Scotland 2014, 3) but is recorded in national (Canmore) and council Historic Environment Records and managed through advice from local authority archaeologists. The record is also dynamic, with a 14.5% growth in the number of sites entered into Canmore between 2008 and 2014 (Historic Scotland 2014, 6). Some of that growth comes from fieldwork commissioned as a result of planning conditions, research or community projects but many gaps remain. The past remains an unknown quantity and, with remote access, highlighting the gaps in knowledge and areas of potential to the user will become as important as documenting the known heritage. INSPIRE only applies to a limited range of datasets used to inform decision-making processes. It does not address the full range of spatial data created in recording the historic environment, particularly the primary data collected through fieldwork. The Directive also only applies to publicly held data whereas much of the primary archaeological data is created through work undertaken by the private sector, academic research or by community groups. Some of this work will be funded through public grants, which ought to stipulate preservation of data created during the project. For fieldwork undertaken through developer, other private funding or private research there may be no formal requirements to deposit the data with an appropriate archive. Nevertheless, data may eventually be deposited with a public archive, at which point it is held and managed at public expense. Information from a range of fieldwork and analytical techniques provides the primary evidence that informs our interpretation and decision-making processes. Primary data show when and where fieldwork was undertaken and can be used to demonstrate how our understanding of the past evolved. Taken in isolation, distribution maps are presented as true representations of past activity but they promote an in-built bias from past fieldwork projects (Cowley 2011, 45-47). Mapping fieldwork extents and understanding patterns of research helps explain the known distributions and may highlight the deficiencies and gaps in the record. Primary datasets cover a variety of fieldwork activities, including a range of remote sensing techniques, desk-based assessment and landscape analysis, prospective field survey and excavation. They also cover the results of scientific analysis on samples recovered from excavation or environmental investigation as these have a spatial component and help inform our interpretation of the past. Data are expensive to collect, particularly from remote-sensing techniques. Too often 'once this data is recorded and interpreted, the printed report is often seen as the final deliverable, while the digital assets created frequently remain hidden and unused within the source organizations, eliminating any possible knowledge transfer to the wider archaeological community' (Shaw et al. 2009, 1-2). 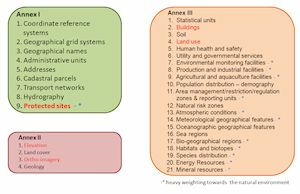 Although the archiving of the primary data is a separate but related issue, creating a spatial index acts as a finding aid, indicating where work has taken place, reducing the risk of duplication, and could be developed to signpost the location of any related archive. Digital technologies are changing the way information is accessed and used. With the growth of INSPIRE-related services the expectation is to access WMS and WFS for a range of spatial datasets rather than continually chase down data from individual reports. Although there may be no legal requirement to collate and publish spatial data from fieldwork, INSPIRE defines best practice for managing a range of datasets relating to the environment through an SDI. Within complex cultural heritage projects, fieldwork often involves a wide range of investigative techniques, from fieldwalking, remote sensing to excavation at one or more locations, or it may be as simple as a watching brief on a development site. These activities fall into the 'Event-Monument-Archive' model where the event 'represents a single episode of primary data collection over a discrete area of land. This single recording event can only consist of one investigative technique and is therefore a unique entity in time and space' (Catney 1998, 3). Fieldwork generates a range of spatial information, from defining the extent of the activity, any observations recorded through the fieldwork, to analysis and interpretation of the results (Figure 4). For each project and every activity within that project there should be a spatial footprint, or footprints, delimiting the overall extent of the work undertaken. These extents may indicate the actual area of investigation – as in the case of the locations of geophysical survey grids, or they may indicate the area within which fieldwork, such as trial trenching, was undertaken. In the latter case both the overall project extent and the locations of the individual trenches should be recorded. Every modern project report should include plans or maps showing the extent of the work undertaken in relation to the surrounding landscape. This information may be gathered electronically in the field or prepared as part of the final project report. Yet beyond the need to produce a report and deposit the project data in an archive, there is almost no requirement to share these data more widely. The spatial value is simply discarded. Although fieldwork extents can be digitised retrospectively from published plans, and assuming that there is sufficient control to geo-locate the fieldwork, the quality of data captured second-hand is inevitably compromised by questions of scale and accuracy. Rather, the people best placed to create and share this information are those undertaking the fieldwork. However, without agreed specifications or templates and no identified responsibility to collate, maintain and deliver spatial indexes for the range, the spatial value of data is not being realised. For geographic datasets the ISO standard ISO 19115-2014 (ISO 2014) defines the schema for describing geographical information and associated services, including contents, spatial-temporal purchases, data quality, access and rights to use (Shaw et al. 2009, 8). The ISO standard, and the UK Gemini 2.2 implementation of that standard (AGI 2012), defines the ten broad categories of information needed to document a dataset (Shaw et al. 2009, table 2) for INSPIRE. INSPIRE-compliant spatial discovery metadata enables the user to understand the nature, content and extent of the dataset while the exploitation metadata provides the information necessary to access, transfer and apply the data. What INSPIRE does not require is the additional exploration metadata needed to understand and assess if the data captured are appropriate for purpose. This form of metadata is particularly relevant in order to understand the appropriateness and data quality of information gathered through a range of remote-sensing techniques. For example, nationally available lidar datasets often only publish the date of capture and point density, or resolution, of the dataset. Although sufficient for the general user to be able to use the data, a minimum number of additional parameters, including instrumentation, scanner type, field of view, laser pulse rate and scan rate, are considered essential for understanding the technology, issues and limitations of the data (Doneus and Briese 2011). 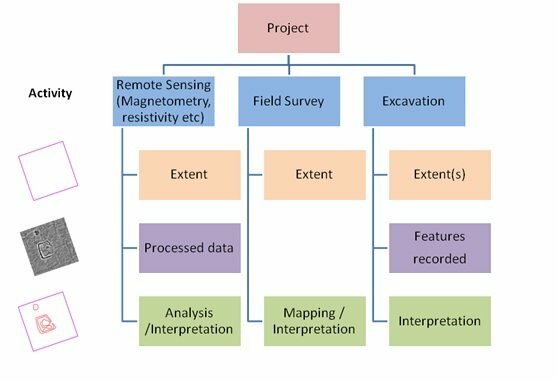 Fieldwork generates a wealth of information or evidence about the past, be it the raw data recorded through remote-sensing techniques, the features mapped during a field survey or the contexts recorded during excavation. Once collated, the data provide the record of the primary fieldwork observations and the evidence for any subsequent analysis and interpretation. Remote-sensing projects produce a wealth of spatial data. The recently published EAC Guidelines for the use of Geophysics in Archaeology (PDF) (Schmidt et al. 2015, 18), identify the following distinct spatial elements typically produced from a survey. In terms of developing spatial datasets for historic environment data, this article is concerned about the locational data, the processed plot and interpretative plans that form three distinct products from any survey. The raw, minimally enhanced and improved data and any outputs are important stages in the process and should form part of the project archive signposted from the spatial index. Technical information about remote sensing techniques can be gathered consistently and stored within a database. An early example is the Historic England Geophysical Survey Database, which was originally compiled in 1995. Users are able to search the database by technique and instrument type, project name and by administrative area or national grid reference. Results are provided as a list of project reports but not displayed against a map. 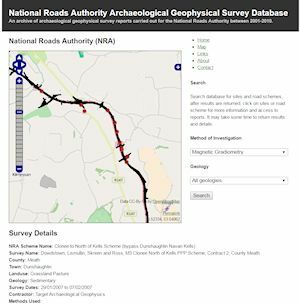 In Ireland the National Roads Authority (NRA) developed the Archaeological Geophysical Survey Database (Bonsall et al. 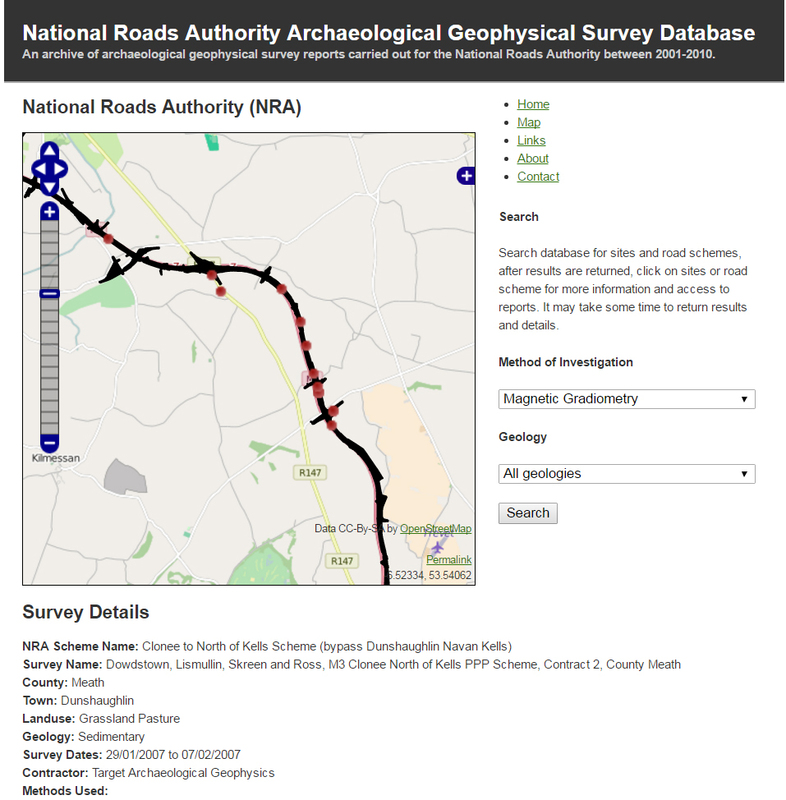 2013), a searchable map index to the archive of archaeological geophysical survey reports carried out by the NRA between 2001 and 2010. Users could filter the database by technique, see the selected locations (but not extents) on the map pane, select a project and see additional attribution, including a link to the online report (Figure 5). As a finding aid the database provided a map-based index to individual project reports but it only shows the location rather than the extent of surveys. The results are displayed as a KML dataset and could be consumed externally but there is no link to download the data. Although neither the Historic England nor the NRA websites fully exploit the spatial potential of the data they hold, in most countries there are not even basic indexes to the surveys undertaken. If spatial indexes to survey extents are generally absent, the value of collating the processed greyscale images into geo-referenced photo-mosaics is being realised through large-scale landscape projects. For instance, the large area surveys undertaken by the Stonehenge Hidden Landscapes Project (Gaffney et al. 2012) contextualise the individual monuments within their landscape. The value of this layer is as a visual reference and background map to the technical analysis and interpretation of the survey readings as well as to data derived from aerial survey interpretation, field survey etc. In presenting the analysis of the data, there is no agreed convention used to describe identified anomalies or their interpretation. Perhaps a trivial concern when viewing the results in a project report, but the lack of consistency is a barrier to combining and harmonising digital datasets from separate project archives into a landscape perspective delivered as WMS and WFS. In contrast to remote sensing techniques where there are separate stages of data processing and analysis, traditional field survey is an empirical process. Based on their understanding of a site or archaeological landscape, the surveyors choose, capture and encode the archaeological features. For many years the role of mapping the archaeology of Britain was the preserve of the Ordnance Survey (Britain's national mapping agency) and the respective Royal Commissions of England, Scotland and Wales. These organisations developed house styles for the standardised depiction of monuments on paper maps and in archaeological inventories (McKeague and Cowley 2013). The availability of digital surveying equipment and the acquisition of a Geographic Information System in the early 1990s enabled the Royal Commission on the Ancient and Historical Monuments of Scotland to map archaeological landscapes systematically for the first time. Organisation of electronically captured survey data managed within a GIS environment led to the development of in-house data standards, encoding the mapped features applied at point of capture through data loggers integrated into the surveying equipment. The grouping of features by broad groups of monument type (for instance 'Ritual or Funerary', 'Settlement', 'Water features', 'Cultivation remains' and 'Bank') enabled the mapped detail to be displayed consistently across discrete survey projects within the GIS (Figure 6) and in print (RCAHMS 1997). However, these house styles do not conform to internationally recognised terminologies (see INSPIRE). Work is ongoing to map the existing terms applied to field survey mapping to the broad categories defined in the INSPIRE registry and national monument thesauri. A similar process is also being undertaken for the airborne transcription programme across Scotland. Once established, the legend can be applied to a range of interpretation layers from field survey, cropmark transcription and interpretation of anomalies observed from a range of remote-sensing techniques. In response to the requirement for Environment Impact Assessments and strengthened planning guidance from the early 1990s, coupled with the widespread availability of digital surveying equipment, many more organisations now undertake archaeological field survey. Each organisation developed their own in-house recording methodologies and house styles for published reports. Data collected during these surveys are seen as part of the process in producing the reports and the long term reuse value is not considered beyond deposition as part of the project archive (with Historic Environment Scotland). There is neither the framework nor the relevant data standards to collate data from individual surveys to build a collaborative archaeological landscape map. To do so requires coordination, policies and infrastructure – the attributes of an SDI. Most Historic Environment Records across Britain as well as more complex Urban Archaeological Databases (UADs), set up in England and elsewhere, record excavation information as part of a generic 'Events' table and layer within their GIS. Project and trench extent data may either be received digitally or digitised retrospectively from publication plans. Best practice and efficiency suggests that the data should be captured during the fieldwork and shared with the data curators – those best placed to collate, manage and share the overall dataset. A wide range of recording systems have evolved to record the wealth of contextual, artefactual and sample data from excavation. Many of these developed independently, meeting organisational, or even individual, project requirements although there are now a number of software applications available providing the coordination, framework, rules and structure to systematically record excavations. Applications like the Integrated Archaeological Database (Rains 1995), Intrasis and Ark display many of the characteristics required for a Spatial Data Infrastructure including, for the latter, the ability to publish data as WMS and WFS. Lack of consistency in terminologies and the legacy of fragmented datasets, applications and terminology prevents the full potential of these resources being tapped, although these issues can be addressed through semantic approaches (Binding et al. 2013, 555). Although the value of scientific data is in the results of the analysis, location is an essential component in the associated documentation of each sample. There have been various initiatives to compile indexes to scientific dates across the British Isles. Many, like the Dendrochronology Database developed by the Vernacular Archaeology Group and hosted by the Archaeology Data Service, are searchable online and enable users to download data. 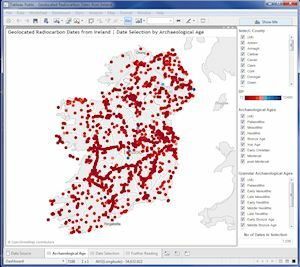 In Ireland Chapple has published privately an online 'Catalogue of Radiocarbon Determinations and Dendrochronology Dates' (Chapple 2015) that includes options to download the data or view and filter the geo-referenced data through a Tableau dashboard (Figure 7). Viewing the data spatially enables the user to see quickly which sites have been sampled, but there are no explicit links between the locations of the analysis and the relevant records in the respective national monuments records. In Scotland these links have now been made for the Scottish Radiocarbon Database (originally compiled by Patrick Ashmore), where the user views radiocarbon determinations associated with individual sites through Canmore. A WMS has been developed primarily to display locations on Canmore but may also be accessed publicly. As part of the preparatory work for the successful nomination of the Antonine Wall to be inscribed as part of the transnational UNESCO World Heritage Site Frontiers of the Roman Empire, the extents of all archaeological interventions were digitised from individual site reports and collated into a GIS layer. The project brought together data from a range of sources, including geophysical survey, airborne photographic transcriptions and excavations from 1980 to 2006, from both published and unpublished sources, to produce a series of layers, mapping the extents and observed features from each event (Jones 2007). At the time WMS and WFS technologies were in their infancy so a CD with the data was provided to the relevant local authority archaeologists and other key stakeholders. The process of manual data transfer was time consuming and restricted the wider visibility and reuse of the data. On completion of the nomination documentation, the dataset has not been maintained to incorporate the results of new fieldwork. Adopting the principles of INSPIRE outlined above, particularly that data should be collected once and maintained at the level where this can be done most effectively, would help address this issue. A thematic SDI would introduce the governance and rules to ensure that data captured in the field from a range of practitioners met an agreed specification and was passed, preferably under an open licence, to a coordinating organisation maintaining and publishing the overall dataset. There are currently no agreed technical specifications defining what attributes are required to document primary fieldwork datasets. As a minimum, there should be a unique identifier for each 'event' undertaken, the type of activity (perhaps referencing a controlled terminology such as the Event terms published by the Forum for Information Standards in Heritage (FISH)), when the event took place and by whom, with a link to related resources. For more technical datasets created through remote sensing, additional technique-specific metadata should be defined. Fieldwork, analysis and interpretation creates a wealth of spatial and spatially related information but the value and potential of that data is often not realised beyond the individual project. Despite the born digital character of data, too often it is seen as a means to an end, providing illustrations for the project report or publication or occasionally for use in a project website. The emphasis is on project reporting, leaving the value of the data in its spatial context, or wider landscape, unrealised. The data, or evidence, are either discarded, languish forgotten on a hard drive without thought to the long-term digital preservation or deposited as individual files in an archive. The techniques may be digital but too often the approach is antiquarian. In focusing on the project the wider landscape context of the data is lost. There is a need for consistency in the data we map, to deliver efficiencies and remove overheads from continually re-processing data. A little more effort in data collection and management saves time by many others later. Consistent cartographic representation of our collective knowledge of historic environment datasets is essential as more and more information 'is compiled, stored, manipulated, and exchanged in digital files and geospatial databases' (Federal Geographic Data Committee 2006, 1). Good spatial data management should inform understanding of historic landscapes and underpin effective decision making and management of that resource. For example, in discussing the use of inventories to protect cultural property in the event of armed conflict, Stone (2013) observes that 'accurate, complete, accessible, and secure inventories of all types of cultural property are an obvious requirement for the good management of such resources – which include archaeological sites, historic buildings, museums, and archives and libraries'. However, 'unfortunately, such inventories frequently exist only as aspirations. When natural and human-provoked disaster strikes, the lack of good data is cruelly exposed, and significant heritage is often lost, along with the information it contains'. Issues identified included the lack of comprehensive datasets, inconsistent data standards and duplication of effort as well as quality of information, from the accuracy of GPS data to locate sites to the detailed coordinates (spatial extents) needed to define a cultural property. He observes that the problem is not restricted to current conflict zones but 'only relatively recently was the United Kingdom able to provide detailed boundary data for some larger World Heritage Sites, including Stonehenge and Hadrian's Wall' (Stone 2013). A thematic SDI should also inform and be informed by, research agendas and frameworks. Themes in national and regional research frameworks (for instance the Scottish Archaeological Research Framework (ScARF)) should align with the broad categories defined in the INSPIRE registry (see INSPIRE) and national monument thesauri and be implemented in national and local record systems to provide seamless linkages between the frameworks and datasets. Consistent data is also an essential requirement to communicate our understanding of the historic environment to a wide audience ranging from the professional user to the general public. The benefits are not just for the profession but with more and more environmental data accessible online, working practices are rapidly evolving. Environmental consultants, planners and others expect to access and use data remotely alongside other datasets on their desktop GIS. Automated processes within software applications and in the Cloud will consume and analyse data as a service. The expectation is to access instantly, not to chase digital data and then manipulate that data to a common template. This article argues for realising the potential from spatial data through a collaborative approach between those creating the data and those responsible for curating it. To do so needs the development of a Spatial Data Infrastructure for the historic environment, building on the requirements for INSPIRE. Many of the building blocks are already in place (Figure 8). As highlighted throughout this article, although there is a wealth of resources, efforts to define the relevant datasets and data requirements are fragmented across Europe to the detriment of the heritage we are trying to protect. Multiple authors acknowledge the issues. De Roo et al. (2013, 619) observe that 'a common data model seems to be necessary to expand the spatiotemporal analyses and understanding of archaeological data. On the one hand, closed data formats have hampered the integration of multiple data sources. On the other hand, in archaeology no standardization exists, resulting in a wide range of data models each typical of an archaeological organization'. In Italy the complexities of 'homogenization of the Archaeological Cartographic Data on a National Scale in Italy' (Azzena et al. 2016) are being addressed through SITAN (National Archaeological Geographic Information System) while the Spanish have proposed a data model for cultural heritage within INSPIRE (Fernández Freire et al. 2014). Archaeology comprises a vast amount of heterogeneous datasets with relevant spatial references. Sharing these datasets is essential to link knowledge from different practitioners. Spatial Data Infrastructures provide suitable models and technological solutions to develop a consistent approach to the organisation, standardisation and dissemination of heritage datasets. 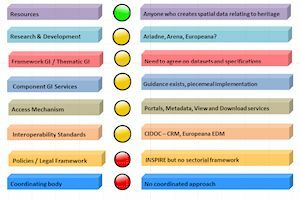 In particular the European SDI initiative (INSPIRE) clearly targets environmental data, but only applies to data in the public sector and only requires access to data on protected sites (European Commission 2007). However, the Directive provides the model for and the foundations on which to build a thematic SDI for heritage datasets. INSPIRE provides a legal framework and policies and defines the access mechanisms and component GI services. The limitations of INSPIRE for historic environment data are acknowledged but the potential is recognised 'for the archaeological research community [INSPIRE] presents an opportunity to facilitate transparent access on research data and thus enrich knowledge of individual scientists. This could be a motivation for the cultural heritage community to envision a broader approach and ensure data dissemination that goes beyond legally protected sites' (Kohr et al. 2013, 1). There is a wealth of research and development into data aggregation through the CARARE and EUROPEANA projects as well as the recently launched ARIADNE Portal, developed under the Ariadne Research Data Infrastructure project (Aloia et al. 2017). However, spatial content is largely restricted to generalised locational data rather than representing the spatial extents of records. These European projects are underpinned by the Europeana EDM and CIDOC-CRM respectively, pointing to interoperable datasets. The limitations of the CIDOC-CRM for spatial data have been discussed by Fernández Freire et al. (2014, 22-23) who observed that for INSPIRE 'the spatial dimension of things is inherent to them and embedded in one of their properties, rather than as a separate concept such as Place in the CIDOC-CRM and other models'. Approaches to managing spatial data are fragmented, from different interpretations of what is a Protected Site to defining associated attribution. What is lacking is a coordinated approach across the profession to harness the potential of spatial data for the historic environment. Coordination is notable by its absence. Although the need for a thematic SDI is global, there is no formal mechanism to define and apply spatial data standards for historic environment data internationally. 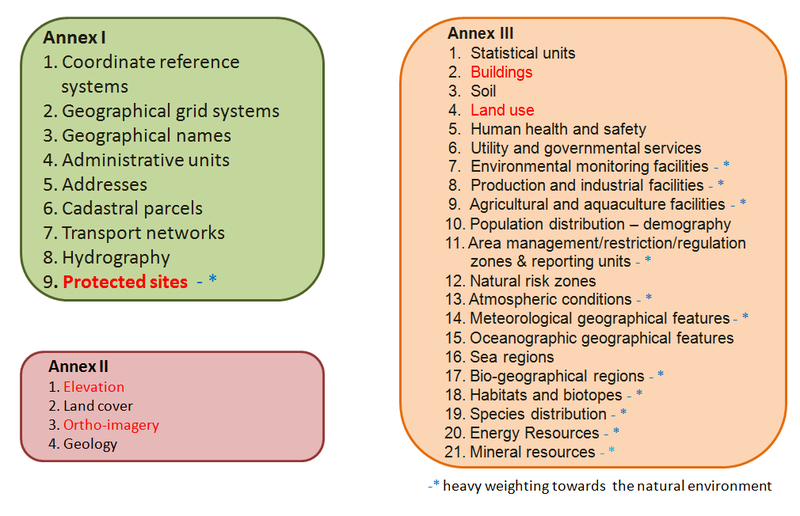 Without an international framework it is left to individual authors and institutions to make the case for managing spatial data effectively (cf. McKeague 2011; Rodier et al. 2013; De Roo et al. 2013; Fernández Freire et al 2014; Azzena et al. 2016; Moreau and Nurra in prep.). With INSPIRE as a catalyst, there are a number of national or regional initiatives. In Italy the impetus came from national legislation (Azzena et al. 2016; Moreau and Nurra in prep. ), while for Spain the lead was taken by the Instituto de Ciencias del Patrimonio (INCIPIT), the national research body for Heritage Sciences, working within IDEE: the Spanish SDI (Fernández Freire et al. 2014, 10). Beyond INSPIRE, the Institut National de Recherches Archeologiques Preventives (INRAP) in France recognised the value in data consistency from its fieldwork programme (Moreau and Nurra in prep.). In Britain, the Forum for Information Standards in Heritage (FISH) and the Scottish Historic Environment Data Strategy [PDF] (SHED: SMRForum 2014) provide opportunities for curators to coordinate and discuss data standards, yet implementation beyond datasets mandated by INSPIRE remains largely aspirational. Without investment by curators in managing and delivering viable spatial datasets to demonstrate value in the approach, it remains challenging to secure buy-in from those creating the data. To develop a sustainable SDI requires a collaborative approach from government agencies in providing the framework, standards and infrastructure, with researchers, archaeological practitioners and funding bodies adopting and delivering consistent data. For historic environment data the emphasis has been on appreciating the cultural significance of individual monument, landscapes or artefacts rather than considering how others see and view data. Spatial data about the historic environment should be at the heart of good decision making but is noticeable by its absence. To get cultural heritage to work for Europe the need to shift from 'an object-orientated approach towards a spatial approach in heritage planning' and to 'consider cultural landscapes early as part of land use and spatial planning processes' is recognised (European Commission Directorate-General for Research and Innovation 2015). Apart from best practice in spatial information management and delivering efficiencies in data collection and management, developing an SDI for the historic environment would help deliver European Commission and national policies, help inform the decision process, stimulate research and contribute positively to the economy (McKeague et al. 2012). The drivers for change are there but the coordination is absent. The question is if the OpenStreetMap community can develop a collaborative approach to produce an editable map of the world, why can't the historic environment profession collate their data? The arguments presented in this article have benefited from roundtables at the Computer Applications in Archaeology and European Archaeological Association Annual Conferences in 2015 and the authors would like to thank participants at those sessions for sharing their knowledge and experience. The authors are also very grateful to Kirsty Lingstadt at Historic Environment Scotland for reading through an earlier draft of this article. Azzena, G., Busonera, R., Nurra, F. and Petruzzi, E. 2016 'Homogenization of the Archaeological Cartographic Data on a National Scale in Italy' in S. Campana, R. Scopigno, G. Carpentiero and M. Cirillo (eds) CAA 2015 Keep the Revolution Going. Proceedings of the 43rd Annual Conference on Computer Applications and Quantitative Methods in Archaeology, 2 vols. Oxford: Archaeopress. 283-92. Binding, C., May, K., Souza, R., Tudhope, D. and Vlachidis, A. 2013 'Semantic technologies for archaeology resources: results from the STAR project' in F. Contreras, M. Farjas, and F.J. Melero (eds) CAA 2010 Fusions of Cultures. Proceedings of the 38th Annual Conference on Computer Applications and Quantitative Methods in Archaeology, Granada, Spain April 2010, British Archaeological Reports International Series 2494, Oxford: Archaeopress. 555-61. Bonsall, J., Sparrow, T., Gaffney, C., Armit, I. and Swan, R. 2013 'Underground, overground', Seanda 8, 14–15. http://www.tii.ie/technical-services/archaeology/resources/Bonsall-et-al-Article.pdf [Last accessed: 9 February 2017]. Cabinet Office 2013 Policy Paper G8 Open Data Charter and Technical Annex. 18 June 2013. https://www.gov.uk/government/publications/open-data-charter/g8-open-data-charter-and-technical-annex [Last accessed: 9 February 2017]. Catney, S. 1998 'So what is an event? ', SMR News 7. http://www.heritagegateway.org.uk/gateway/file/hg/content/upload/her_file_store/4882.pdf [Last accessed: 9 February 2017]. Cowley, D. 2011 'Remote sensing for archaeology' in D. Cowley (ed) Remote Sensing for Archaeological Heritage Management, Occasional Publication of the Aerial Archaeology Research Group 3 and EAC Occasional Paper 5, Budapest: Archaeolingua. 43-55. De Roo, B., Bourgeois, J. and De Maeyer, P. 2013 'On the way to a 4D archaeological GIS: state of the art, future directions and need for standardization' in 2013 Digital Heritage International Congress vol. 2. Institute of Electrical and Electronics Engineers (IEEE). 617-20. ResearchGate [Last accessed: 9 February 2017]. Doneus, M. and Briese, C. 2011 'Airborne laser scanning in forested areas –potential and limitations of an archaeological prospection technique' in D. Cowley (ed) Remote Sensing for Archaeological Heritage Management, Occasional Publication of the Aerial Archaeology Research Group 3 and EAC Occasional Paper 5, Budapest: Archaeolingua. 59-76. Federal Geographic Data Committee 2006 FGDC Digital Cartographic Standard for Geologic Map Symbolization, US Geological Survey http://ngmdb.usgs.gov/fgdc_gds/geolsymstd/fgdc-geolsym-all.pdf [Last accessed: 9 February 2017]. Fry, D. 2007 'Inspire Directive', GIS Professional 15, April 2007, 18. 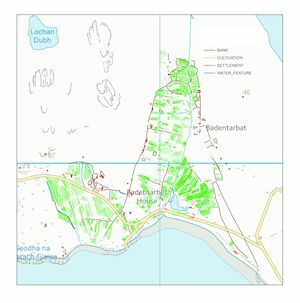 Historic Scotland 2014 Scotland's Historic Environment Audit 2014. https://www.historicenvironment.scot/media/2392/shea-2014-main-report.pdf [Last accessed: 9 February 2017]. 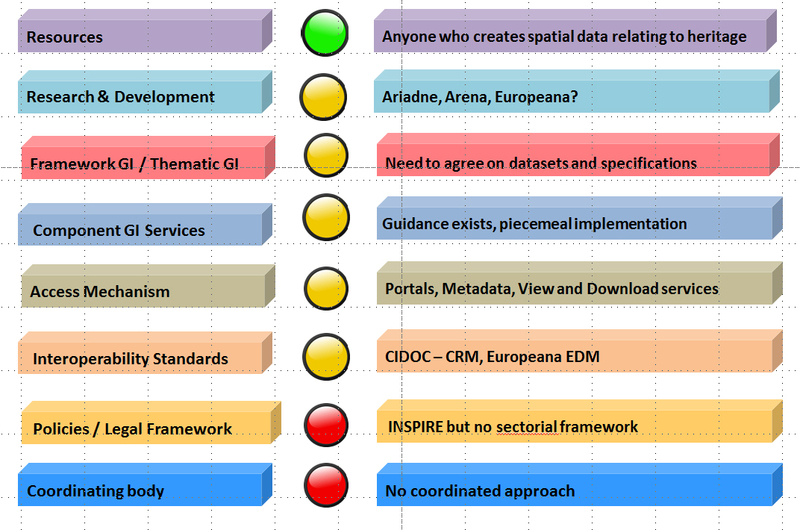 INSPIRE 2009 D2.8.I.9 INSPIRE Data Specification on Protected Sites – Guidelines http://inspire.ec.europa.eu/documents/Data_Specifications/INSPIRE_DataSpecification_PS_v3.0.pdf [Last accessed: 9 February 2017]. Jones, R. 2007 'Event mapping along the Antonine Wall' in Historic Scotland (ed) The Antonine Wall, Frontiers of the Roman Empire World Heritage Site Proposed Extension, Historic Scotland, 128-30. https://www.royalsoced.org.uk/cms/files/fellows/antoninewallnominationdoc.pdf [Last accessed: 9 February 2017]. Kohr, T., Bruhn, K-C., Karmacharya, A., Cruz, C. and Boochs, F. 2013 'An SDI for archaeological data with a RESTful interface to semantically modeled information' in Geoinformatiks, Mar 2013, Heildeberg, Germany. https://hal-univ-bourgogne.archives-ouvertes.fr/hal-00878217 [Last accessed: 9 February 2017]. Lov om kulturminner 1978 Act of 9 June 1978 No. 50 Concerning the Cultural Heritage. https://www.regjeringen.no/en/dokumenter/cultural-heritage-act/id173106/ [Last accessed: 9 February 2017]. McKeague, P. 2011 'A spatial perspective: one Scotland, one geography – one historic environment?' in E. Jerem, F. Redő and V. Szeverényi (eds) On the Road to Reconstructing the Past. Computer Applications and Quantitative Methods in Archaeology (CAA). Proceedings of the 36th International Conference. Budapest, April 2-6, 2008, Budapest: Archaeolingua. 117-22. McKeague, P. and Middleton, M. 2013 'Beyond INSPIRE: towards delivering richer heritage data, in Scotland' in G. Earl, T. Sly, A. Chrysanthi, P. Murrieta-Flores, C. Papadopoulos, I. Romanowska and D. Wheatley (eds) Archaeology in the Digital Era. Proceedings of the 40th annual conference of computer applications and quantitative methods in archaeology (CAA) Southampton, England, Amsterdam: Pallas Publications. 313-19. 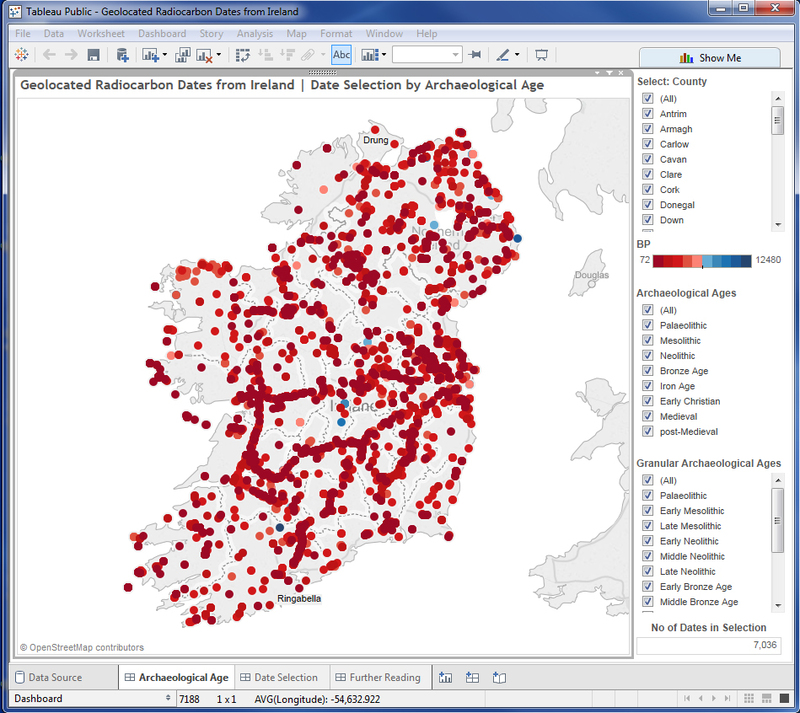 McKeague, P., Corns, A. and Shaw, R. 2012 'Developing a spatial data infrastructure for archaeological and built heritage', International Journal of Spatial Data Infrastructures Research 7, 16-37. http://ijsdir.jrc.ec.europa.eu/index.php/ijsdir/article/view/239 [Last accessed: 9 February 2017]. Moreau, A. and Nurra, F. in prep 'Towards a European standard for spatial data management for archaeological heritage: experiences in France and Italy' in CAA Exploring Oceans of Data, CAA Oslo 2016. Rains, M. 1995 'Towards a Computerised Desktop: the Integrated Archaeological Database System' in Huggett, J. and Ryan, N. (eds) Computer Applications and Quantitative Methods in Archaeology. CAA Conference, Glasgow, UK, 1994, BAR International Series 600 (Oxford 1995). 207–210. Rodier, X., Ciezar, P. and Moreau, A. 2013 'Using GIS in French rescue archaeology. The choice of Inrap: a tool for research at the scale of excavation' in F. Contreras, M. Farjas and F.J. Melero (eds) Fusion of Cultures. Proceedings of the 38th Annual Conference on Computer Applications and Quantitative Methods in Archaeology, Granada, Spain, April 2010, British Archaeological Reports International Series 2494, Oxford: Archaeopress. 217-20. Shaw, R., Corns, A. and McAuley, J. 2009 'Archiving archaeological spatial data: standards and metadata' in Online Proceedings Computer Applications to Archaeology 2009 Williamsburg, Virginia, USA. March 22-26, 2009, 1-15. http://archive.caaconference.org/2009/articles/Shaw_Contribution187_c%20(1).pdf [Last accessed: 9 February 2017]. Schmidt, A., Linford, P. Linford, N., David, A., Gaffney, C., Sarris, A. and Fassbinder, J. 2015 'EAC guidelines for the use of geophysics in archaeology. Questions to ask and points to consider', EAC Guidelines 2. http://old.european-archaeological-council.org/files/eac_guidelines_2_final.pdf [Last accessed: 9 February 2017]. Stone, P. 2013 'War and heritage. Using inventories to protect cultural property', Conservation Perspectives Fall 2013, Heritage Inventories. http://www.getty.edu/conservation/publications_resources/newsletters/28_2/war_heritage.html [Last accessed: 9 February 2017]. Tudhope, D. and Binding, C. 2016 ARIADNE D15.1 Report on Thesauri and Taxonomies. http://www.ariadne-infrastructure.eu/Resources/D15.1-Report-on-Thesauri-and-Taxonomies [Last accessed: 9 February 2017]. Verweij, P., Winograd, M., Perez-Soba, M., Knapen, R. and van Randen, Y. 2012 'QUICKScan: a pragmatic approach to decision support' in R. Seppelt, A.A. Voinov, S. Lange and D. Bankamp (eds) International Environmental Modelling and Software Society (iEMSs) 2012 International Congress on Environmental Modelling and Software. Managing Resources of a Limited Planet: Pathways and Visions under Uncertainty, Sixth Biennial Meeting, Leipzig, Germany. http://www.iemss.org/sites/iemss2012/proceedings/E2_0708_Verweij_et_al.pdf [Last accessed: 9 February 2017].